(Bloomberg) -- The Golden State Warriors’ new arena is already setting revenue records, even though the doors haven’t opened yet. 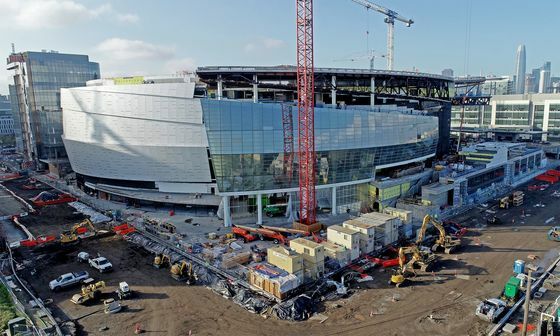 The National Basketball Association champions have taken in an unprecedented $2 billion in the form of tickets, suites and sponsorships, more than double the franchise’s estimate for the privately financed Chase Center in San Francisco, according to team President Rick Welts. The Warriors have become an example of how to build a new arena with private money, rather than the government subsidies demanded by many pro teams. But it hasn’t gone entirely smoothly. According to Welts, the project will cost around $1.3 billion, which is 30 percent over budget. Welts jokes that he’s hatched a plan for whenever the team’s majority owner, Joe Lacob, expresses concern about cost overruns. “We tell Joe, ‘Just go back and look at those championship rings in your office and you’ll feel much better about the whole thing,’” he said. The Warriors, who currently play at Oracle Arena in Oakland, have won three championships in the past four seasons, including the last two in a row. Their roster includes former Most Valuable Players Stephen Curry and Kevin Durant. The 18,064-seat arena is scheduled to open Sept. 6 with a concert featuring Bay Area band Metallica and the San Francisco Symphony. The Warriors’ first preseason game is slated for Oct. 5 against LeBron James and the Los Angeles Lakers. Besides JPMorgan Chase & Co., which will put its name on the arena, other sponsors include United Airlines, PepsiCo, Accenture and Google Cloud, which, according to Welts, hadn’t previously made a sports deal. “The corporate sponsorship side has found a real sweet spot with what’s going on in our industry right now, and the companies are looking to invest in sports,” Welts said. The arena is the centerpiece of an 11-acre mixed-use development in the Mission Bay neighborhood. It’ll include two office buildings and 29 retail locations. A Lacob-led group bought the team in 2010 for about $450 million. The Warriors are now worth $3.5 billion, third in the league behind the New York Knicks and Los Angeles Lakers, according to Forbes.